Cash for Gold is here! Are you wondering what to do with your precious metals you no longer want? It couldn't be easier to turn them into cash at Niagara Coin and Collectibles! We will buy everything from new, used or broken jewellery to coins, watch casings and many other types of gold. Specifically, we buy 9K, 10k, 12k, 14k, 18k, 22k and 24k Gold Earrings, Gold Necklaces, Gold Broaches, Gold Pins, Gold Bracelets, Gold Wedding Bands, Gold Engagement Rings, Gold Class Rings, Gold Cluster Rings, Gold Cocktail Rings, Gold Statues, Gold Coins, Gold Medals, Gold Lockets, Gold Charms, Dental Gold, Gold Grills, Gold Watches, Scrap / Damaged Gold, Gold Broken Chains, Saudi Gold, Dubai Gold, all Foreign Gold and Gold items with missing Stones and just about any other Scrap Gold! 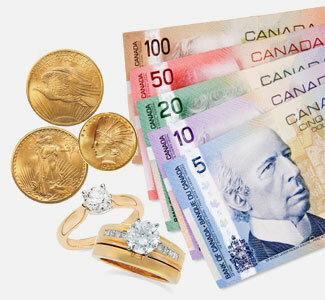 We guarantee to give you the best price on your scrap gold and offer same day cash for gold trades– so come into Niagara Coin and Collectibles and trade your gold for cash today!